I drew this when i was eight. HORSES RULE! I called this horse Whisper. wow... that was great and i think i might draw that myself. It's really good. You said you drew it when you were 8 so I guess I believe you but. If you did draw that when you were 8 YOU GO GIRL! I am 13 and I draw as good as that if not better but for an eight year old that is great!!!!!!! This is a different Kenzie than the one that first commented.. Funny how she has the same title name on here as me. I think your drawing is amazing!!! You are so talented!!! Please post more of your drawings. It just takes my breath away to see such wonderful drawings!! OMG, I have never drawn a picture as good as that in my life. i just turned 11 recently! You were eight! I am eleven and I cant even get close to that! Good job! this is so realistic! u have talent! OMYGOSH I LOVE IT!! keep up the good work its great! OMG I can't believe you drew that at eight!!!!!!!!!!!! 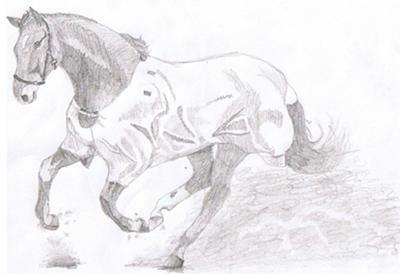 I'm 12 and can't draw half as good and I'm always trying to draw horses! You are so grat and I'm a big fan!!!!!!! wow you drew that at eight I can bareley draw a body can you give me some tips? Hey i love it to! and its a great drawing..
but i dont believe an 8 year old drew it. Anyway, no matter how old you are, ITS REALLY GOOD! you drew that when you were EIGHT????!!!! OMG you are really good I can't draw like that and I'm 12! wow that is so good that you drew it when you were eight! I love it!